So you have a big event or festival coming up and you need to wow your audience with a stunning lighting display. Don’t worry, because you are in great hands with RGB Lights! We are your one stop shop for all of your LED lighting needs. We will provide you top notch products that are backed by great customer service and installation. You have most likely seen some of our work on display at the White House, the Audi A3 launch, or the Chicago White Sox stadium just to name a few. We are your premier manufacturer of adaptable LED solutions for all of your indoor and outdoor projects. You can read more about the team at RGB Lights and some of our projects on the About page of our website. Let’s explore some of the important things to look for in a company when shopping for a lighting solution for your next big event or festival. Festivals take time to plan and every detail is extremely important. Lighting in any type of production can make or break the entire show. 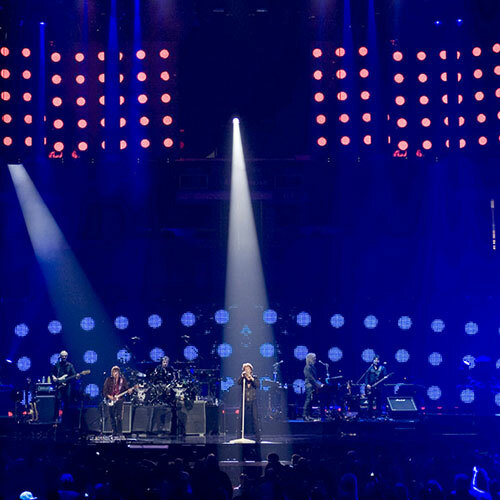 Festival lighting has to be precise, look incredible to the audience, and run smoothly for the entire event. You will want to make sure that the lighting company you choose has multiple years of experience doing these types of events so you can put your mind at ease. Let the lighting experts take over so that you can focus your time and energy on other details of the festival. So how do you determine whether a company has adequate experience or not? Looking through their project portfolio to see examples of their work is a great way to do this. Feel free to take a look at our portfolio. 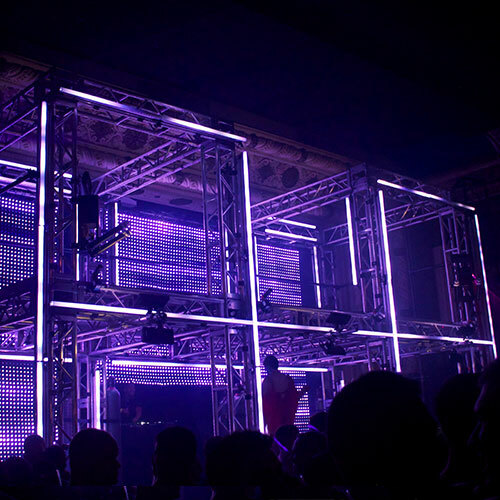 If you like what you see, RGB Lights will be able to design a similar setup for your event of festival. You also may want to take a look at some of the clients the lighting company has worked with in the past, size of previous projects, and how well the lighting systems were designed. This will give you some insight on how much experience they have. Specifically look for a previous project they have done that will be similar in size and design to the one you are planning. As you can see on our lighting Project Page we do a variety of lighting designs that will make your festival unique and beautiful. If you don’t see exactly what you’re looking for, please contact us as we are known for our custom fabrication capabilities. Our lighting experts can turn your vision into something extraordinary with their many years of experience. We are confident that we can bring to life anything that your heart desires. Festival lighting needs to run smoothly so you can have the amazing production that you desire. This has a lot to do with the company’s customer service and communication with you throughout the whole designing and planning process. Before deciding to work with a company, pay attention to how they connect with you. Is it in a timely manner? Do they respond to phone calls and emails quickly? Do they try to cater to your every need and question? Don’t be afraid to ask them for exactly what you want and need. Like we said before, lighting can make or break a show that you are spending a lot of time and money on. This is why you want clear communication well before the festival takes place. See how hard they work to meet your needs, how much they care about the best possible outcome for your festival, and how professionally they speak to you. Spectacular customer service is something the team at RGB Lights truly cares about. Creating your lighting fantasy is what we do, and we execute it professionally with constant communication with our clients. This ensures that you are beyond happy with our team and with the lighting solution that we provide. Let us give you peace of mind on the day of your festival by taking over all your lighting needs. You can meet our amazing team that you will be working with on our About page. We will closely work with you step by step to provide the most incredible lighting solution for your specific scenario. If any issues arise, we will be right there to fix them. Reputation means everything when it comes to choosing which lighting company to hire. You want to know that they will deliver the best job they possibly can. You want your money to go to a reputable company so you won’t have to worry about a thing on the big day. In order for companies to succeed in the lighting industry, a great review means the world. Local companies can rely on good word of mouth and great testimonials from their previous clients to get them more work. Customer reviews online and on social media are just as important. Before choosing a festival lighting company, do your homework. Find their social media accounts and see what past clients are saying about their work and the experience they had when dealing with that specific company. You can search the company online in a search engine and find reviews if they are well known. Go on their website and find testimonies of their past and current clients. This research and homework is important if you want to choose a reliable and reputable company so it is definitely worth your time. Our website has many of our past projects along with the client’s name, location, pictures, videos, and a description of the project. We provide this information because we are confident in the fact that if you contact our clients for a testimony of our services, they will give you an incredible review. You can also check out our social media links on our Home page to find out more about our clients and our work. RGB Lights the Right Company for You! As you can see, it is important to do your research before deciding to work with a lighting company. RGB has all of the qualities you should look for and is dedicated to providing outstanding finished products to their customers. Check out our Connect page to start your dream LED lighting project today!